Back in 1989, a kid was abducted by some weird creature while his younger brother watched. A hunter in the making? Why, you would be right! Young Jesse will show up later, as one would expect. But before that, in the present day, some people start going missing. Well, one girl only kind of goes missing, only to turn back up with bright green eyes and making weird chittery noises, and just generally looking monstrous and creepster. The brothers, at their wits end after losing Casifer to Amara, decide to follow up on this case of missing people. Basically, every 27 years a bunch of people go missing, or show up with these green eyes acting all horny and strange before going missing. 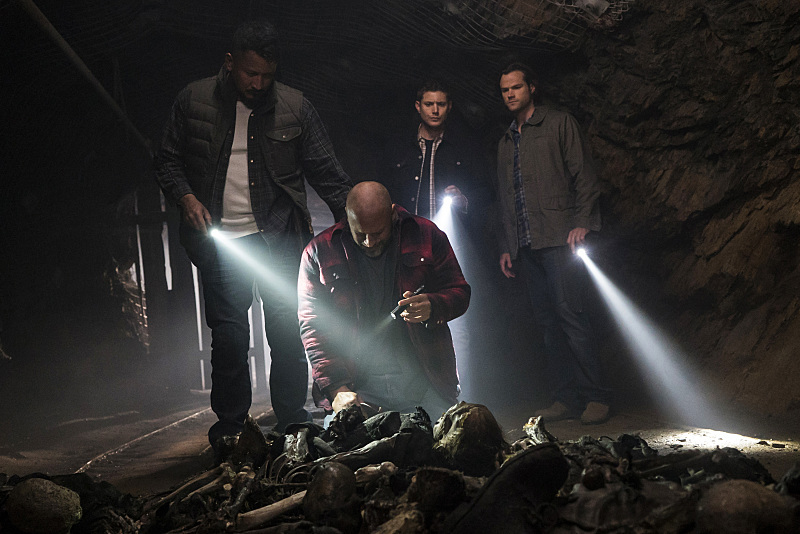 While investigating, Dean happens to be attacked by one such creature, and is saved from being bitten by Jesse and his hunting partner Cesar. Only Cesar is not only his hunting partner, he's also his life partner. Not that it really matters, but okay. So, they team up. Dean and Cesar go in search of the burrow of the creatures in the forest while Sam and Jesse go to find the sheriff who was in charge back in the day. I'm not sure why, but apparently they think he might know something? Sure. Anyway, the creatures in question are these cicada spirit creatures that turn up and mate every 27 years, then go back underground and die and the cycle continues. But the original one has to inhabit a human body or something? Whatever. Let's be honest, I don't really care about these creatures very much. Dean and Cesar find the burrow pretty easily, even though Jesse and Cesar had been trying to find it for days with no luck. Most of the people are already dead, or harboring the womb creatures, blah blah. Sam and Jesse confront the sheriff and he confesses his daughter was one of them, so that's why he didn't do anything about it? Or something. Whatever. I don't see the point of them going to that guy in the first place. Nonetheless, Jesse gets to have his closure with the things that took his brother. And, honestly, pretty easily so, in the scope of Supernatural episodes. They barely had to fight the things or investigate them. But the real point of the episode came at the end, when the Winchesters thought maybe they should recruit the guys to help them in their big Darkness fight. But when they revealed they were hanging their hats up to go, like, raise some horses and such, Dean decided it was better to let them have their happily ever after. - The message of this episode may have had more impact some seasons ago when the brothers were wondering whether they could have a life after hunting. It seems like they've pretty much decided they're going to do it until they die (for realsies) at this point, so it didn't have many parallels to their current situation. - I was hoping this episode would be another surprise highlight of the season, as most of them not featuring the main storyline have been. Alas, I was pretty bored. Was I the only one? - I feel like Dean would've come up with some kind of garage situation for the impala at the bunker place by now, no? Dean: Sleeping is the new smoking. Sam: What? No it's not. Sitting. Sitting is the new smoking. Dean: That can't be right. 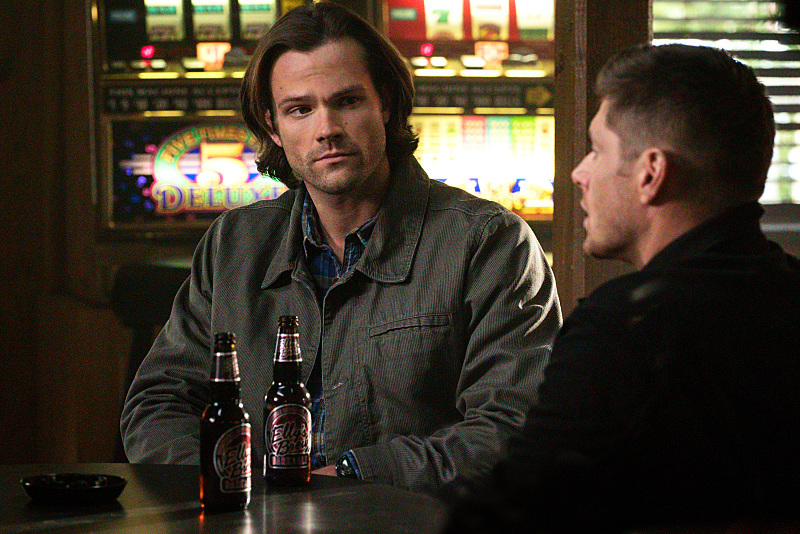 Sam: We're not actually gonna go with junkless on this one, are we? That's a new low, even for us. Sheriff: What is this, Spanish fly gone bad? Only Cesar is not only his hunting partner, he's also his life partner. Not that it really matters, but okay. It matters a lot to some of us who are queer and like to see equal representation on shows. And that was my point in that comment. It didn't make a difference to anything going on, it just was.